Heat 1/3 cup of the broth to boiling in 10-inch skillet. Cook garlic in broth 1 minute, stirring occasionally. 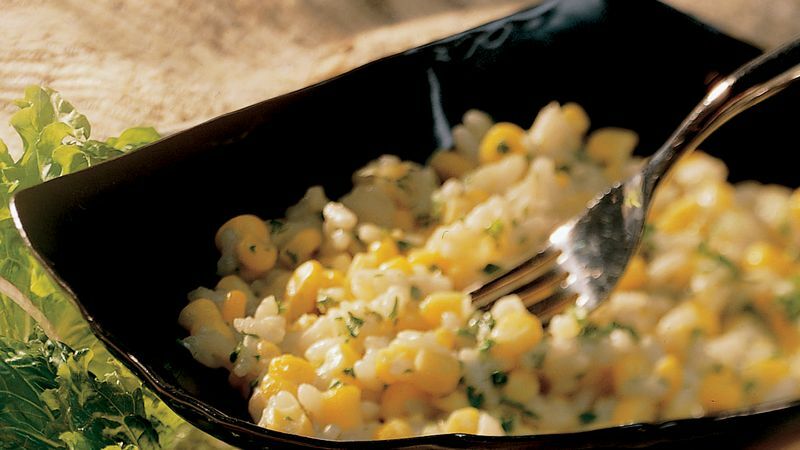 Stir in rice and corn. Cook 1 minute, stirring occasionally. Stir in remaining broth. Heat to boiling; reduce heat to medium. Continue cooking uncovered 15 to 20 minutes, stirring occasionally, until rice is tender and creamy; remove from heat. Stir in cheeses and parsley. Arborio rice, a specialty of Italy, creates the creamiest risotto, but you can substitute any short-grain white rice in this recipe. Serve risotto with a Caesar salad and French bread for an easy weeknight meal.